If Plato required any inspiration for his tale of the destruction of the mythical city of Atlantis, there were any number of examples of cities that had slipped beneath the surface of the Mediterranean to their doom. Volcanic eruption, earthquake and their resultant tsunamis had spelled the doom of more coastal cities and towns than we are yet aware of. Here is but a sample of some of the most amazing, best preserved and accessible of them. Each new find—and more are made each year—yields fresh fodder to Plato’s account, even when not in accord with history. Thonis-Heracleion A monumental granite statue of a pharaoh from the fourth century bc in the submerged temple of ancient Thonis-Heracleion. While it is unclear how and exactly when the city sank into the sea, the discoveries at Egypt’s primary customs port have been astounding. The city lays some seven metres (23 ft) beneath the waves where the Nile Delta meets the Mediterranean, five kilometres (three miles) off the city of Alexandria. It was a major port that sank 1200 years ago, although its history spanned centuries before that. In the first century ad, Seneca condemned the city for its wealth, corruption and decadence. It has some impressive finds, as buried beneath the sand, they have been well preserved. 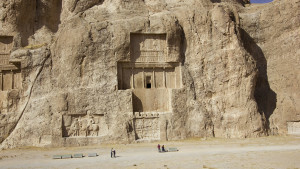 These include a massive temple to Amun-Gereb and statuary up to five metres (16 ft) tall. Other artefacts include limestone animal sarcophagi and stone idols, ships, coins, jewellery and hieroglyphic tablets. The city’s vulnerability was the fact that it was built on soft, unstable mud islands and criss-crossed by canals. It submerged when the land beneath it liquefied. 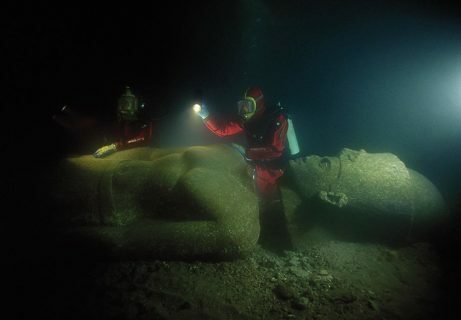 It has only been rediscovered in recent times (see our article on page 34, “Sunken Cities: Egypt’s Lost Worlds”). Baiae One of many preserved statues in the sunken city of Baiae in the Bay of Naples. Today the ancient remains can be visited in one of the world’s few underwater archeological parks. Beneath the Bay of Naples lies a dormant volcano, which over a vast period has at intervals impacted places as far away as Eastern Europe. 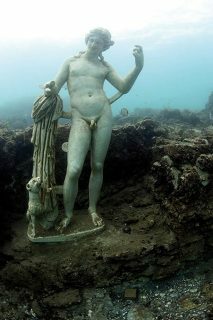 In the sixteenth century ad, its activity caused the city of Baiae to sink beneath the waves of the Mediterranean. In its heyday, Baiae was a seaside resort on the Bay of Naples frequented by the likes of Julius Caesar, Caligula, Nero and Cicero. It was a luxurious spa town, infamous for its hedonistic lifestyle: its mineral hot springs were fuelled by the very volcanic activity that would later seal its fate. In the eighth century ad, the city fell prey to Arab pirates, but it was something far less romantic or sensational that led to its demise. The blight of malaria saw it long abandoned before its submersion. The waters of the shallow bay closed over most of the city, leaving extensive ruins and statuary hidden unknown for centuries. It now forms part of an underwater archaeological park, which can be explored today. Visitors view the crumbled structures and preserved statuary through glass-bottomed boats, snorkelling, and scuba dives allow people to swim amidst the submarine ruins. Some items excavated on site are preserved at the town’s archaeological museum. Pheia was a small city on the west coast of Greece located on an isthmus connecting the mainland with the Cape of Katakolon. It was conquered by Athens during the Peloponnesian War and became the headquarters of its shipping military supply lines. Unfortunately, it sat in a seismically active area and in the sixth century ad an earthquake saw the city slide into the sea. Today, it lies five metres (17 ft) below the surface. 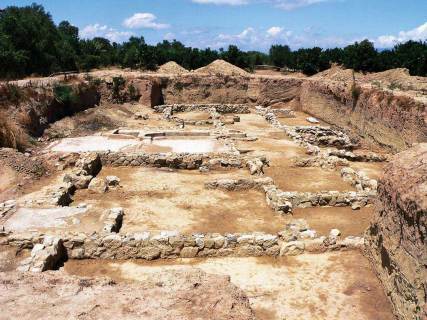 Building remains, prehistoric pottery and coins are among the many finds made there. In addition to the sunken deposits two Cycladic marble figures from the Bronze Age have been found on the headland, as well as the remains of Roman buildings and tombs on the island of Tigani. Excavations at ancient helike. The city was discovered on the shoreline of a dried lagoon, rather than in the Mediterranean proper. Some think that the city’s destruction may have been Plato’s inspiration for his tale of Atlantis. The site of the ancient Greek city of Helike was lost to all but legend for many centuries, as searches of the Bay of Corinth proved unsuccessful. What was known was that in 373 bc, an earthquake and tsunami saw it submerge with little warning. The city was lost for centuries until recent times, when it was discovered on the shoreline of a dried lagoon—rather than in the Mediterranean—which is why it was not found. The city had in fact been visible beneath the waters of the lagoon for 500 years following the disaster; its walls and a statue of Poseidon forming an ancient tourist attraction. But what remained of the site was eventually buried by river siltation. 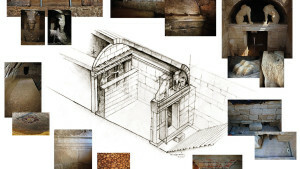 Its location was eventually confirmed in 2012, discovered beneath later Greek and Roman settlements. Copper coins from the fifth century bc showed the image of Poseidon on one side and his trident on the reverse. Evidence of an even earlier Bronze Age settlement almost 5000 years old has also been uncovered deeper beneath its ruins. 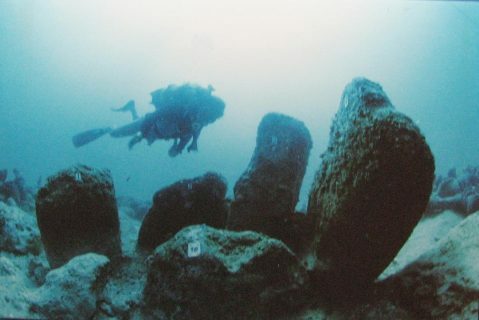 Some have thought that the city’s destruction may have been Plato’s inspiration for his tale of the fate of Atlantis as it was a contemporary event. Pavlopetri is named for the small, modern town that lies near this ancient city site, situated off the southern coast of Greece in about four metres (13 ft) of water. Disaster struck the Early Bronze Age city some 3000 years ago; its demise possibly due to an earthquake and resultant tsunami. Before its destruction it had thrived as a hub of human activity for 2000 years. What remains is evidence of a road system, a scheme of channels and water pipes, double-storey dwellings with private gardened courtyards, temples, a cemetery and an 800-m2 plaza. It was an apparently sophisticated civilisation with officials, scribes, merchants, potters and bronze workers, farmers and shepherds, soldiers and sailors among its citizenry. There are many small artefacts in situ, which testify to its long history. The sunken city of Olous, Crete, situated off the present day town of Elounda. It is thought to have existed as far back as Minoan times. Once a powerful city-state with a stable government, the only visible remnants of the city today are some scattered wall bases. 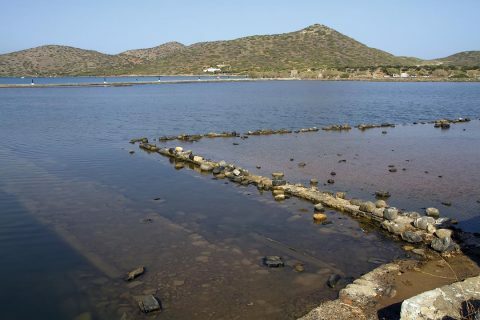 Olous was one of the many cities of Crete mentioned by Homer, and finds from this sunken city confirm its history stretches back further to Minoan times. Vritomartis, a mermaid goddess of Minoan origin, was reverenced there until Roman times and coins have been found showing the image of Zeus. The city was populated at different times for extended periods. While there have been more ancient finds at the site, its heyday was in the eighth century ad, before becoming an impracticable capital because of Arab piracy. It experienced a resurgence in the fifteenth century when the Venetians constructed salt pans in the area and the site became commercially viable once again. It was a Greek city of 30–40,000 people at the time of its destruction. It lies in shallow water in Poros Bay, where part of the city wall is visible above water at low tide. Its foundations, built on the sand of the foreshore rather than the limestone rock formations, spelled its inevitable demise when an earthquake precipitated it into the sea. 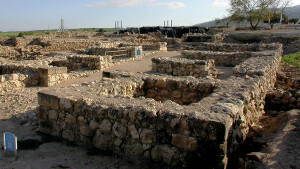 Atlit Yam is regarded as one of the earliest and best-preserved prehistoric settlements of the Mediterranean coast. At the centre of the settlement are these seven stone megaliths (one to two metres high), weighing up to 600 kilograms each, arranged in a semicircle. Atlit Yam lies about a kilometre off the coast of Israel near Haifa, lying in 12 metres (40 ft) of water. It is regarded as one of the earliest and best-preserved prehistoric settlements of the Mediterranean coast. The site is said to date from the late Neolithic era, and there are artefacts of stone, bone, wood and flint. It is regarded as a village rather than a city; nevertheless the finds are impressive. They include large stone houses, paved floors, courtyards, fireplaces and grain storage as well as the remains of prehistoric flora and fauna, including both domesticated and wild animals, and seeds from domesticated wheat, barley, lentils and flax. A stone-lined well is preserved, as are stone altars, and an impressive stone circle still stands around what had been a fresh water spring. Skeletons excavated from graves reveal cases of malaria and tuberculosis. Expert opinion is divided over the cause of the village’s demise, however one theory posits that a tsunami caused by the collapse of a side of Mount Etna, may have inundated many coastal settlements, Atlit Yam among them. The presence of these submerged cities lost beneath the sea indicates how vulnerable coastal sites really are to the vagaries of nature over time. The earth is not as stable as one might like to think. Contemplate the liquefaction and sinking of Christchurch, New Zealand, in very recent times, for example. Coastlines quite often sink (and sometimes rise, such as at Napier, New Zealand) in zones adjacent to tectonic plate activity. And these sites are but some of many to whet a scuba-diving reader’s appetite. So when next in Europe, plan to visit some of these fascinating sites. 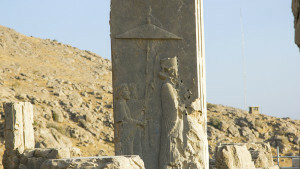 The Hittites were a lost nation whose presence was long denied. Archaeological Diggings founder and first editor David Down reveals the story of their rediscovery and recognition in history. If the pools exist, then what about the miracles alleged to have occurred there? Michael Ventris trained and worked as a successful architect, but the work for which he is remembered, he did in his spare time—deciphering and translating Linear B, an ancient and more abstract linear style of writing of the Minoan civilisation. Using guile and guts, he brought reforms to the empire that ensured its survival. Recorded on tomb and temple walls, papyrus and sarcophagi is a plethora of information for traversing the afterlife.